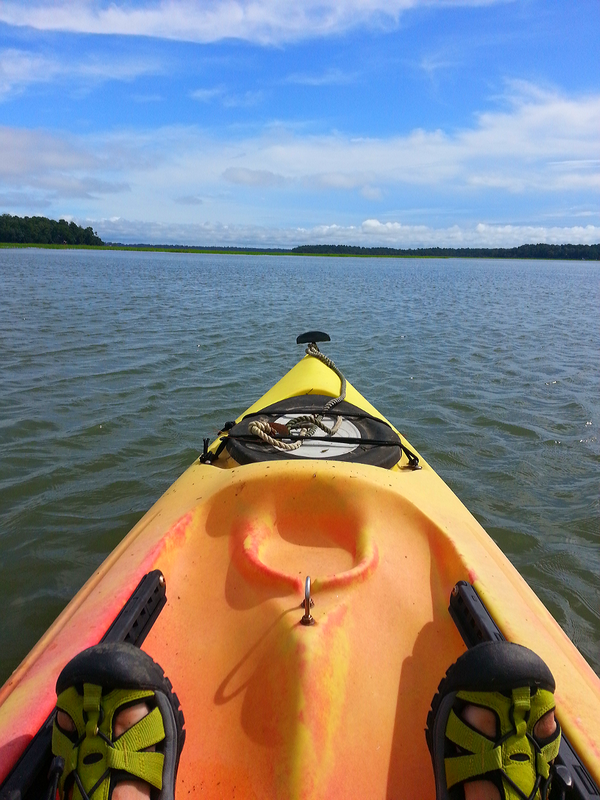 Paddling a kayak through Lowcountry creeks, rivers and estuaries is an experience to be savored. It is an experience ripe with expectation and anticipation of seeing nature in action. To me, the chance to paddle through a pod of dolphin and coming eye to eye with these magnificent mammals, to experience the peaceful quiet of floating just above the water’s surface with the sound of water lapping gently upon the side of your kayak, to hear the wind ruffle the marsh grasses and to be privy to sights seen only when venturing out on kayak leaves an indelible memory. I am fortunate to live with the rivers and marshes in my backyard and I’ve been wanting to share with you tales and pictures from two recent kayak outings. Last June I and my spouse, took a tour of the ACE Basin (an acronym for three converging rivers – Ashepoo, Combahee and Edisto). Colorful kayaks navigating the rice fields in the ACE Basin, SC. 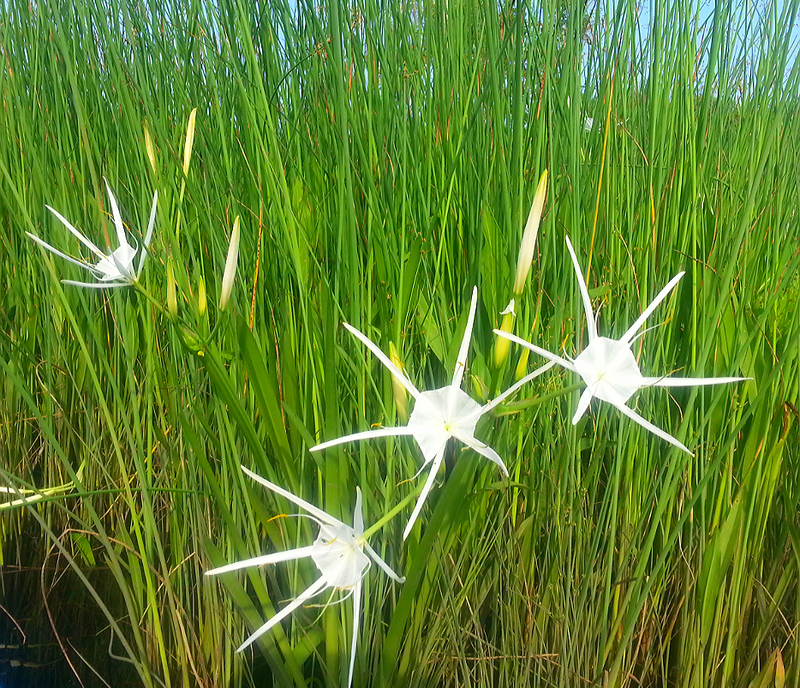 The 2-hour tour, sponsored by the Callawassie Island Kayak Club and guided by David and Kim from Beaufort Kayak Tours (www.beaufortkayaktours.com) took 20 or so of my neighbors into creeks and waterways (formerly rice fields) in search of the short blooming Coastal Carolina Spider Lily. We were told that these plants bloom in early summer for only two weeks. We were very fortunate to see them in bloom. These pictures, while very nice (especially one by my friend Joan) don’t show the detail of these amazing flowers. They grow right into the marshes and marsh grass. 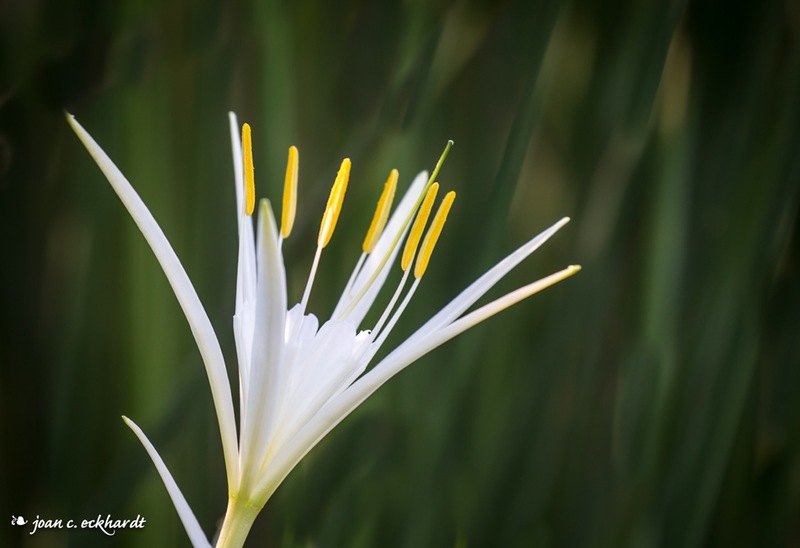 Coastal Carolina Spider Lily. Posted with permission. 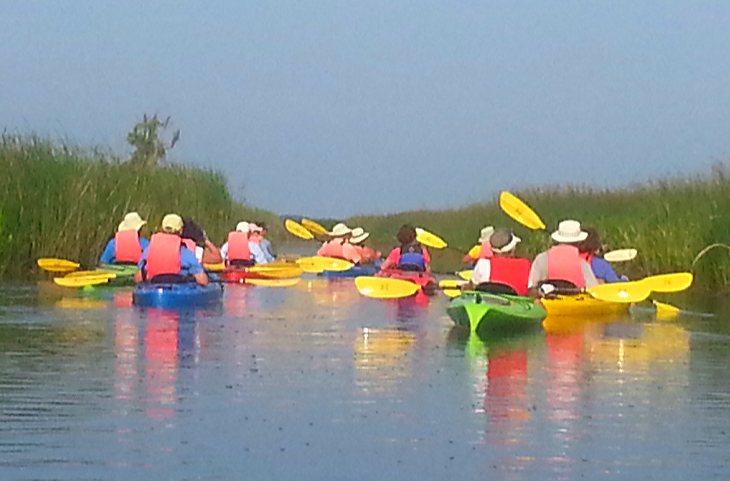 Beaufort Kayak Tours offers exceptionally informative guided tours throughout the Lowcountry coastal ecology. They do all the heavy lifting and provide everything you need to have a safe and enjoyable journey. The second outing occurred last week. At the gentle urging from a friend I finally took to the Lowcountry waterways in my new, gently used (a fabulous find) kayak. This was a “just for fun” trek into the Chechessee Creek that surrounds Callawassie Island (www.callawassieisland.com). This was a very (and equally enjoyable) different experience. What made this different? First, without tour guides to handle all of the details my friend and I had to figure out the tide charts and determine the best time to launch. Second, we were the one’s to carry the kayaks (takes two people) from the storage racks to the kayak dock and back again. Third, one of us was going to have to get into and out of the kayak without assistance. I left this task to my friend who is much stronger and more in shape than I! Finally, you need to pack your own snacks and water (very important in the summer heat) and keep track of all your belongings. 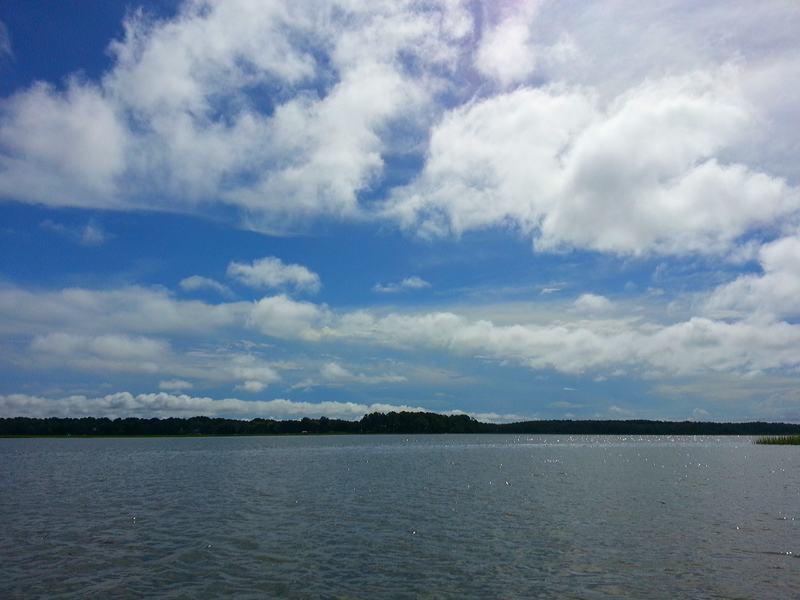 We went out just before high tide for an hour and a half round trip. We hoped to see dolphin following the fish coming in with the tide and we were not disappointed! We saw several, including a female dolphin and her calf. They came within 15 to 20 feet of our kayaks. The only disappointment was not getting a picture of these lovelies – so you know this isn’t a fish tale! We had a lovely time. For me it was a bit of a watershed moment. Going solo (sans tour guide) was a first for me. It was exhilarating and scary at the same time. I found that my sense of awareness was greatly heightened and at the same time I felt remarkably peaceful. Also, I was reminded that memorable times don’t happen without a willingness to do some planning and take care of all the small tasks, in this case, making the time, getting together the life vests, paddles, food and water and getting the kayaks to and from the docks. Plan, work, then fun! The current is always a factor. Whether you are paddling with or against the current it is necessary to keep paddling in the direction of your intended goal to make steady progress. To stop paddling puts you at the mercy of the tide and wind and can take you on an unintended path. Set your vision beyond the tip of the kayak. If you focus on only the tip of the kayak you will steer off course. Your eyes must be trained beyond the kayak to a point in the distance. Remember the way home. You will need to return to the dock so keep an eye for distinctive landmarks that provide “breadcrumbs” for the return trip to your safe haven. Be attentive to your surroundings, pay attention to prevent time-consuming navigational errors. Stay calm, use creative problem solving. Even the smallest tide fluctuation can change the landscape and impact your visual perspective. Be ready to implement alternative, safe plans if needed. Team up. Don’t go it alone. The journey is safer and more joyful when shared with others. By the way, did you know that the word kayak is a palindrome – a word that can be spelled the same both forward and backward? Just a little word trivia. What beautiful pictures! I have done some kayaking locally but have yet to invest in a boat of my own. There are some amazing sea caves under the La Jolla cliffs that I would love to explore. Those Spider Lilies are lovely! I’ve never done ocean kayaking – that would definitely be a new and exciting experience! I love La Jolla and the cliffs and did not know about the sea caves. Be brave, get a guide and get out there! Thanks for you post. Our local botanical garden offers a kayaking adventure in the surrounding waters. Maybe one day I will try it. I’m pretty sure I’d never get my husband on one. All it takes is one experience and you will be hooked! Going with a guide is the best way for that first experience. If you go by yourself, first, your husband with catch your enthusiasm! Thanks for this! What a courageous woman you are! Did you see any gators? Loved your courage and adventure. Also the parallels to what you learned/life. Thanks for sharing your new wisdom. I think the key is to always keep paddling and know there will need to be corrections made along the way! Thanks for your supportive comments.